ClubCoins Necesarios: 108 Please note that, for now, you cannot download content from our platform directly onto a mobile device (phone, iPod, iPad, tablets...). You need to download your items onto a PC or Mac, and then transfer them onto your device in the normal way. We are working on allowing direct downloads to mobile devices but this is not possible in the current version of the platform. Sorry about the inconvenience! 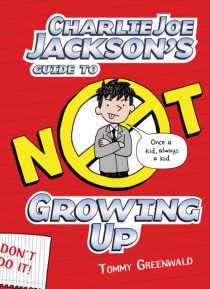 As graduation day approaches, Charlie Joe is starting to realize being a kid isnt so bad after all, in this hilarious, final installment of the Charlie Joe Jackson series.Yes! Graduation day is finally here! Charlie Joe has been waiting for this moment his entire middle school career. This might even be the best day of his life. No more teachers! No more books! Just make it through the ceremony an… d hes free. But suddenly things around him are starting to change. Words like responsibility and college prep keep popping out of his friends mouths. What happened to words like fun and pool party? And come to think of it, doesnt high school bring more teachers and more books? Maybe this whole growing up thing isnt such a good idea after all. Actually, being a kid is pretty darn fun! Surely Charlie Joe can figure out a way to put the brakes on growing upand fast!